"Hi. I . . . I . . . uh . . . May I speak to the person in charge of author events? Please?" 56% of eBook: "Her story was the same as Grant's. She hadn't even noticed the bottle on the counter, much less seen someone interfering with it." My thoughts: This was a fun read for me that hooked me on the series. Read more in my review, which includes a link to enter a book giveaway. 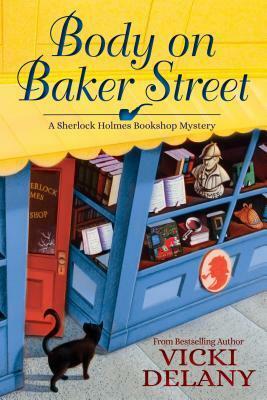 From Goodreads: Gemma Doyle and Jayne Wilson are busy managing the Sherlock Holmes Bookshop and Emporium on Baker Street and adjoining Mrs. Hudson's Tea Room in anticipation of the store's upcoming book signing with the illustrious Renalta Van Markoff, author of the controversial Hudson and Holmes mystery series. But during the author Q&A session, dedicated Sherlockian Donald Morris verbally attacks Renalta and her series for disgracing Sherlock's legacy, only to be publicly humiliated when the author triumphantly lashes back and gains the upper hand. That is until Renalta collapses on the table--dead. Donald insists he didn't do it and pleads to his friends to clear his name. Fortunately, Gemma and Jayne have no shortage of suspects between author's bullied personal assistant, her frustrated publicist, the hapless publisher, a handsome rare book dealer, an obsessively rabid fan, and a world of other Sherlock enthusiasts with strong objections to Renalta's depiction of the Great Detective. It's up to the shrewd sleuthing duo to eliminate the impossible and deduce the truth before the West London police arrest an innocent man in Body on Baker Street, the second Sherlock Homes Bookshop mystery perfect for fans of Miranda James and Kate Carlisle.